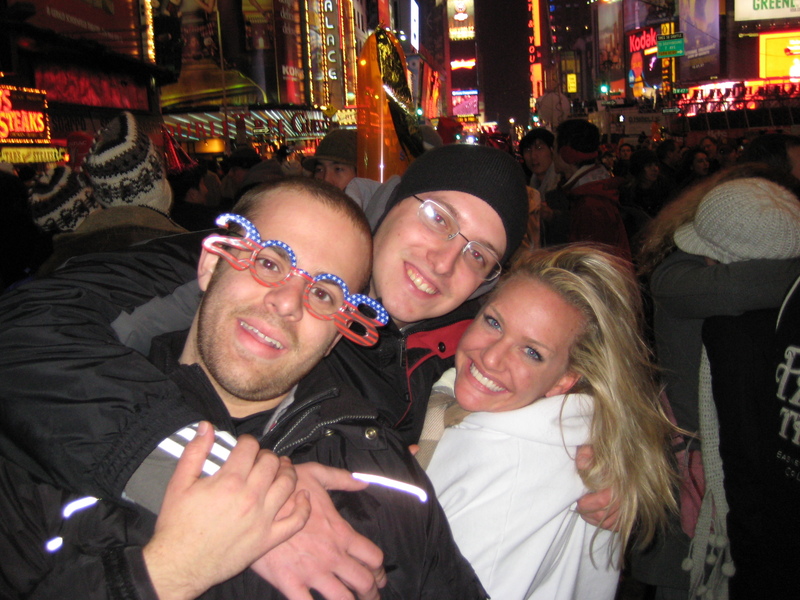 Looking to celebrate the New Year’s with style, I decided to head up to Times Square to ring in the new year.I somehow was able to convince my good friend Josh and his girlfriend to join me. This wasn’t a nice and casual trip to the Big Apple. We decided to take a flight on the morning of the 31st, then take the first flight out on the 1st, allowing us to save money by not getting a hotel. Sounds insane? It was. We landed around noon, and figured out the cheapest (not quickest) way to get downtown. Taking public transportation was an experience of it’s own. $2 by bus to get to the train, then $2 for train to finish off the journey was th e price range we were looking for. First things first… go check out big toy stores…. idea courtesy of Josh. 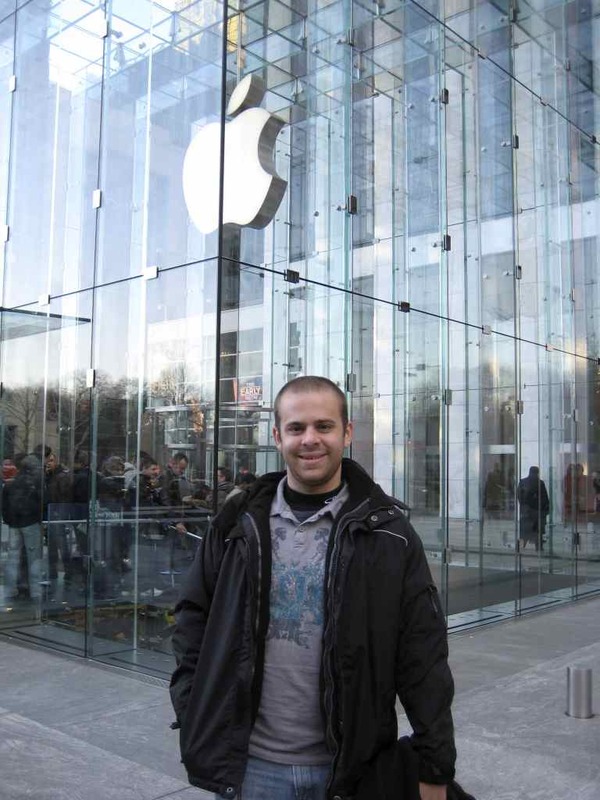 Snapped a few photos in front of the Apple store, then went to go get lunch and prepare for hours of standing. Lunch was at Ray’s Pizza, a local hole-in-the-wall chain. Wasn’t to bad, except for the fact that my stomach didn’t care for it to much. Nothing against the place at all… I’m just not used to having greasy food to eat. Afterwards, we made our way to where the ball was going to be dropped hours later. 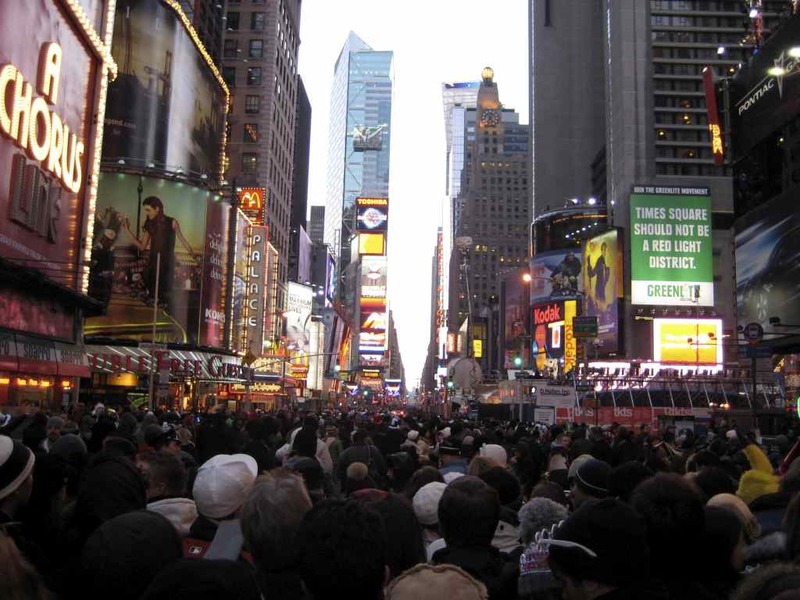 For the New Year’s celebration, the city closes off almost all of 7th and Broadway, and then int ersecting streets as the crowds call for it. They also create “pins,” which is where they fence of the streets for people to stand in, but leave the side walks clear so people can still walk by (cops keep the crowd moving, making sure no one starts to stand). We entered the “pin” around 3:30, and the crowd was already starting to grow at an exponential pace. Our location was maybe 5 blocks from the actual ball, but everyone before us had some type of special pass to get them that close. We were pretty happy with our location. We had 8 hours to go. First few hours started off pr etty slowly, but around 6 pm, things started to pick up. We managed to sneak quite a bit of alcohol in, and that always makes it easier to make friends. Throughout the night, I played Go Fish, watched Scrubs, listened to the various live performances, had a dance off with some random girl, and made numerous friends from all around the world. Every hour, we celebrated what ever New Year was happening at that time. 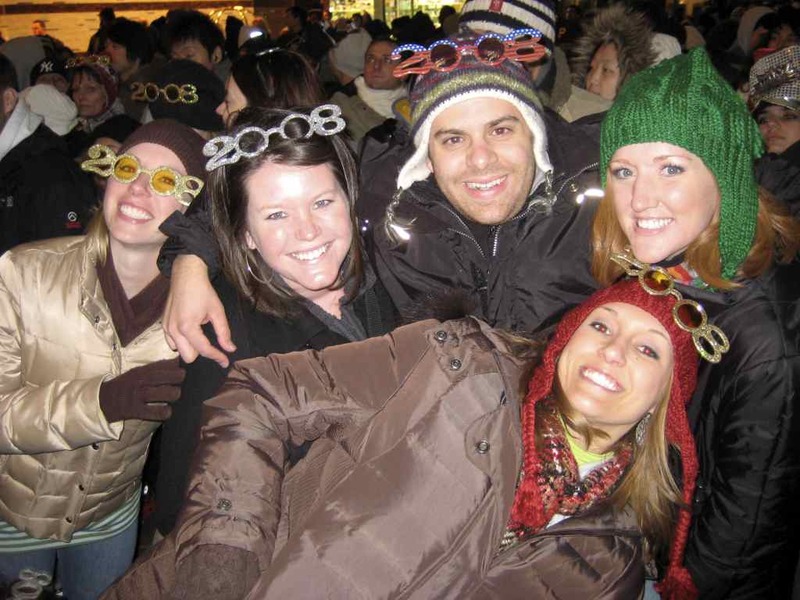 London’s New Year was pretty exciting since a friend I made there, Ben, was from London. The last 4 hours of the wait was a blast… music blasting, people singing and drinking, and random games being played. When it actually hit midnight, the million or so people who were there went wild. 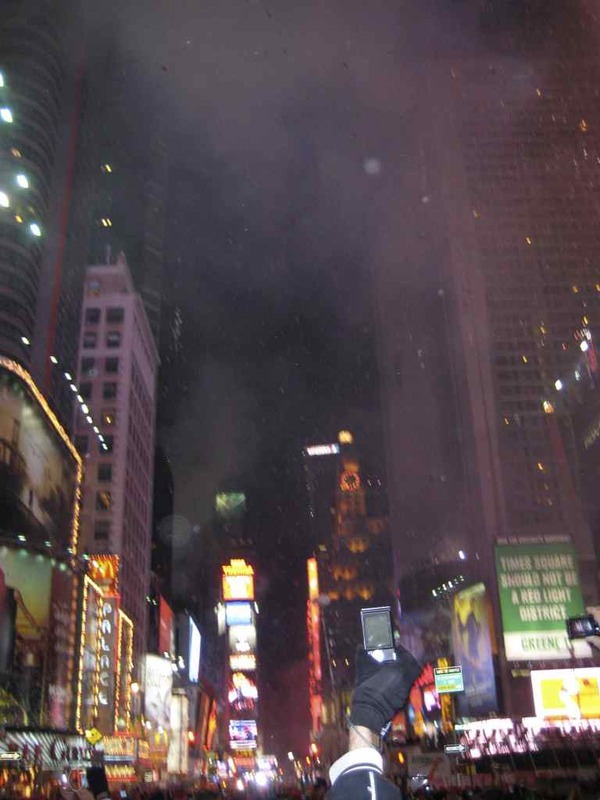 It was amazing to see the city at that time… confetti going everywhere, people yelling, screaming, and kissing, horns and fireworks going off, and music being blasted over the sound system. The ball was a little overrated, but the crowd was not. I had a smile on my face for the hour leading up to it, and when it happen, I was filled with joy. Truly amazing to witness. Our flight was leaving in 6 hours. We slowly tried to leave the crowd, but that was close to impossible. No matter how far we got from Times Square, people were still everywhere. On top of that, my stomach was not liking me, even after throwing up a few times. We eventually found a place to grab some much needed food and liquid (restrooms weren’t available during the wait), and then begin to make our way back to the airport. By this time it was around 2:30 am. It took us nearly a hour and half to get back to the airport, but eventually we made it. We were exhausted, yet all so happy that we pulled it off. Flight back, we all slept almost the entire time. We get back to Fort Worth, and sleept the rest of the day. 1) you said there were 3 pictures. i see one. disappointed. 3)still jealous i didn’t get to go. 4)have fun in London 🙂 i expect another entertaining blog, complete with Multiple pictures! p.s. the site looks good! The whole notion of standing like a smashed pack of sardines without booze or any public restrooms for nearly a dozen hours in the cold never really appealed to me, but sounds like you managed to pull it off and have a good time.